on Friday, February 22, 2019! Come dressed in your finest (or most comfortable) Western attire. (Jeans are great!) The corral opens at 5:30 p.m. and the chuck wagon will start dishing up grub at 6 p.m. The cash bar saloon will be serving up spirits in the main hall. We will have a silent auction and a live auction facilitated by your favorite auctioneer, Butch Hagelstrom! We have some great auction items this year! Some items include a mountain getaway to Ameristar Casino Resort, a week at the luxurious beach resort, Hacienda Encantada, in Cabo San Lucas, homemade tamales from Brighton’s own Tom Delgado, handcrafted art pieces by local artists including Judee Dickinson, Anastasia Bliss, Dot Lindsey, and Dave Thomas, and more. We have sports memorabilia from the Colorado Avalanche and Denver Broncos. There is something for everyone! Don’t miss your chance to rustle up some treasures and support a great cause. We will also be presenting our annual Healing Hearts Award to the Brighton Youth Commission. All proceeds from this event will go to fund our programs and low cost mental health counseling services. Tickets are $25 and will not be available at the door. 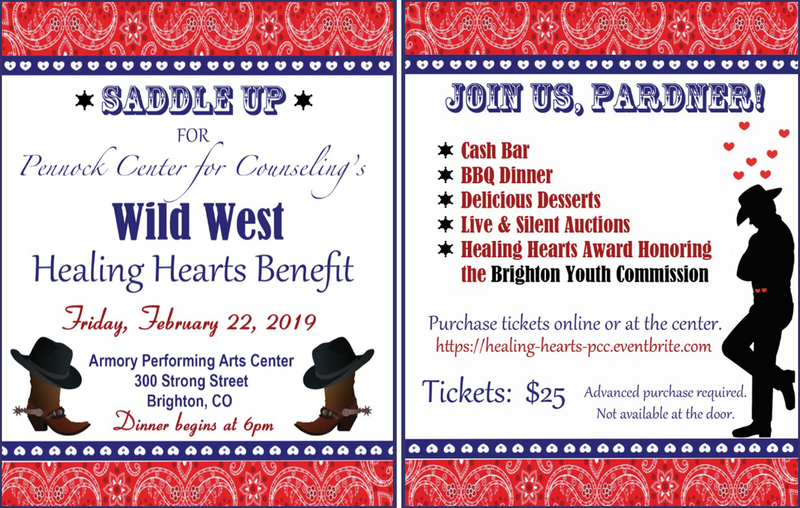 Tickets need to be purchased in advance through Eventbrite.com or at the center, located at 211 S. 21st Avenue in Brighton, CO. Tickets will be available for purchase until Monday, February 18, 2019. Our sponsors have made this event possible. We are so grateful for your support!